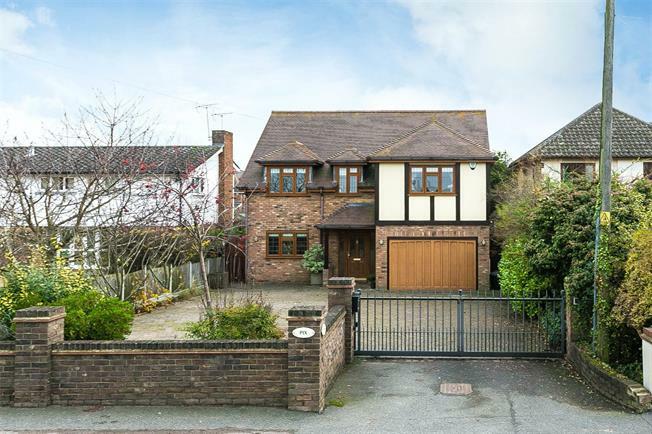 4 Bedroom Detached House For Sale in Essex for Guide Price £1,000,000. Pix is an attractive 4 double bedroom detached executive style home situated within a gated plot and located on the Stock/Billericay borders. This beautiful home is extremely well presented throughout with many fine features and bright interiors comprising: Entrance hallway with an integral door into the garage which has been reconfigured to incorporate a utility room, main reception with bi folding doors over-looking the garden and a feature fireplace, further reception, study, cloakroom, wonderful kitchen/breakfast room recently refitted with extensive units, island, under floor heating, bi folding doors and remote controlled sky lights featuring inbuilt rain sensors. To the upper floor there are 4 double bedrooms all with fitted wardrobes or walk in closets, 3 en suites and a further family bathroom. Outside the rear landscaped garden is approximately 100ft with an expansive patio benefitting from a hot tub and a pergola for outside entertaining leading to the lawn and to the far rear there is a bespoke built 18ft log cabin with a decked area with full power. The garden is bordered by mature specimen trees and shrubs for privacy. To the front the gated paved driveway lends access to the garage and provides ample off road parking. Pix is situated 1.5 miles from Billericay mainline Station with excellent main road links are via the A12/M25 and with highly regarded local schools Buttsbury and Mayflower nearby.